C-RED 3 is the latest camera from First Light Imaging, dedicated to short exposure times applications. The C-RED range of cameras are dedicated to Short Wave Infrared imaging. 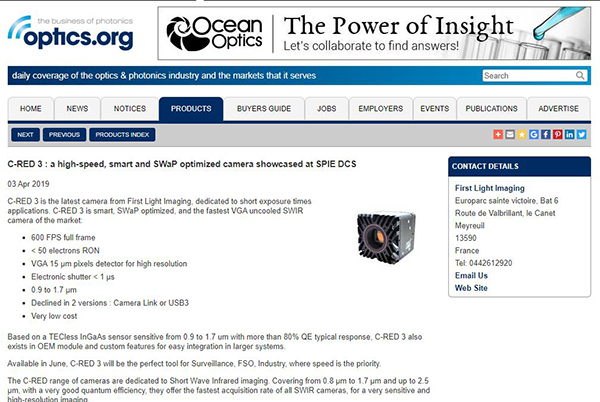 Covering from 0.8 µm to 1.7 µm and up to 2.5 µm, with a very good quantum efficiency, they offer the fastest acquisition rate of all SWIR cameras, for a very sensitive and high-resolution imaging. Initially developed by astronomers for astronomers, the C-RED cameras also find applications in life sciences, industry, inspection and surveillance, in very low light conditions and any environment. C-RED 2 is a high performance, high speed, ultra low noise/low dark SWIR camera, outperforming the capacities of its 640 x 512 InGaAs 15 µm pixels high resolution sensor. Thanks to its state-of-the-art electronics, software, and innovative mechanics, C-RED 2 is capable to run at 600 images per second full frame, with a very low RON below 30 electrons at full speed. The sensor embeds an electronic shutter <1 µs. With windowing and multiple nondestructive readouts, C-RED 2 allows faster image rate while maintaining a very low noise. The camera supports a unique high dynamic range mode (HDR) providing 93dB dynamic range and true 16 bits linear response, having at the same time a low noise below 30 electrons and a full well capacity of more than 1 million electron. The camera can work also in AGC mode (automatic gain control) with standard dynamic range. Easy as plug-and-play, C-RED 2 is able to equip any system, empowering industrials and biophotonics applications. Designed for high-end scientific applications, C-RED One is a SWIR camera based on the e-APD technology, with a state of the art 320 x 256 MCT 24 µm pixels sensor. Able to detect 3500 images per second with a subelectron RON, C-RED One is literally making the invisible visible. C-RED One also offers low dark, wide spectral response, and outstanding cosmetics compared to other SWIR cameras. The camera can be operated in remote locations, thanks to its autonomous cryogenic cooling system. With its user-friendly interface and a large variety of read out modes, C-RED One is the perfect equipment for adaptive optics and research. To learn more about our products and enjoy C-RED 3’s early bird prices, visit First Light Imaging during SPIE Defense and commercial Sensing exhibition in Baltimore on booth 750 from April 16 to 18, 2019.